"Vinyl reissue of Crass' 5th album comes in original fold-out poster sleeve. 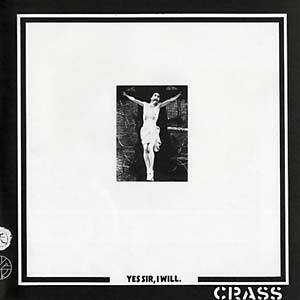 Originally released in April of 1983, Yes Sir, I Will was a howl full of vicious rage and fury, a scream of sorrow, a bitter requiem of betrayal and disenfranchisement. It was a letter-bomb of accusations directed at the British establishment, with its title taken from a conversation between Prince Charles and gruesomely wounded veteran Simon Weston. Musically the work is as diverse and challenging as Crass had yet delivered - a raging and almost free-form improvised backdrop over which Ignorant, Libertine and DeVivre trade off vocally throughout - veering from ferocious roars and rants to piano ballad interludes sung by Rimbaud."